It’s far from obvious in this photo but, I actually included at least two novelty yarns in each tote’s handwoven panel. Doing this project made me view the two very large baskets of novelty yarns that I stumbled upon in front of a very tiny yarn shop in a much more favorable light. Well, this project AND the yarns’ price. . . fill a gallon-sized Ziploc for $3.00! I almost stopped after filling the first bag but then I thought, “When will I ever have this kind of opportunity again? !”, and filled two more. BTW – I flattened the few cardboard cores so they’d take up less room. This entry was posted in Thrifty Treasures, Weaving, Yarn Stash and tagged novelty yarns. Bookmark the permalink. Wow! All that for $9! I don’t know if I could have stopped at 3 bags! 🙂 Those will be great for your totes! 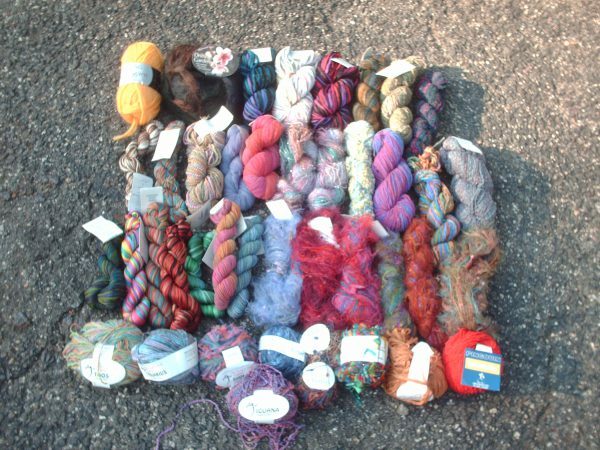 Funny, the remaining skeins weren’t at all tempting to me – fun fur, bleh colors, or duplicates of skeins I had chosen. “Those will be great for your totes!” – exactly what I was thinking! !